Young people meet for prayer once a month in Bangkok. 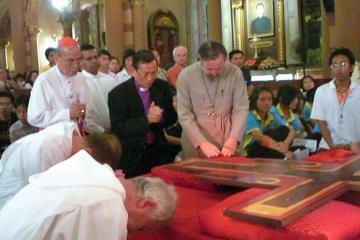 These prayers began during the preparation for Brother Alois’ visit to Bangkok in November 2007. Each month, the prayer takes place in the church of a different denomination; Catholic, Anglican, Presbyterian… but also in a small centre for children run by the Lutheran Church or a student centre of the Church of Christ in Thailand. The prayers are prepared by a small core group that brings together Lutherans and the youth desk of the Catholic Commission for Laity. The prayers aim to be a humble sign of communion that engenders trust, so necessary in the present situation. It will coincide with the arrival of two young people – from Germany and Vietnam who will begin living as a temporary community. They will spend three weeks in a centre for people with disabilities, in Phrae, before joining a mission among the Karen people. The theme of New Solidarity makes us attentive to discovering signs of hope. The work of the ‘Jesuit Refugee Service’ is one such. One of their projects in Thailand is at Ranong, a small town in the south-east of the country, on the frontier with Myanmar; a town where thousands of Burmese come seeking work. The Service has six ‘learning centres’ that welcome almost 900 children. Whilst the government offers children of migrants free access to classes in Thailand schools, many are unable to take part in these, for various reasons. In order to enter one of these schools, some children born in Myanmar have to follow the entire cycle of Thai education, and must therefore recommence their education at the level of primary school. They are older, and finding themselves with much younger children is humiliating; moreover, those that try leave school before the end of the year. Whilst the government asserts that, whatever their legal status, all the children can receive an education, each one must get a ‘provisional passport’, and if the family is large, there is not enough money to pay for one of these passports for each child. A whole lot of work is required to encourage these children to go to school and also to persuade the families. For the children of the numerous migrants who come from Burma and cannot have an education because of poverty and social pressures, opportunities to go to school are rare. Centres do exist – rudimentary and with reduced space – but where the teachers are motivated. Some of the teachers are themselves Burmese migrants with provisional passports. These centres are non-denominational, and the teachers are either Christians from various denominations, or Buddhist, or Muslim. They give a basic education, hoping to prepare the children for entry to a Thai school. 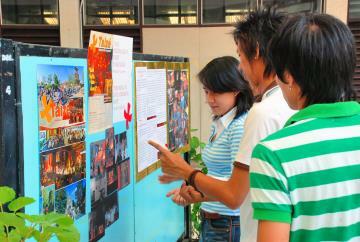 There are also many prejudices and tensions between the Thai and Burmese communities. When you add to these the fear of identity controls in the street, this all contributes to the children not going to school. After the visit to education centres, we went to one of the crossing places between the two countries. There was the Thai border control – a poor affair, not at all like those in airports! This crossing point is on a river; little boats bring migrants there, but also transport foreigners coming to renew their visas. One can get into Myanmar in this way, but once on the other side one cannot go further than five kilometres. There are also other NGOs working at Ranong, either in education, with an online university programme, or with a health programme. In the evening we met together for Mass at the Marists, who also run a learning centre. Several young volunteers from New Zealand are there for a year. The great generosity that inspires all those who work there has need of nourishment, and a project has been created to run a retreat for all the volunteers of these associations. On a rainy Friday afternoon in September a beautiful prayer was held at Heart´s Home, in the middle of densely populated Khlong Toey area in Bangkok. People in this part of the city are mostly poor people. Many struggle much to earn their daily living. The Heart´s Home was however easy to find, local residents pointed us to the right place in a small house on a narrow “soi”. Volunteers of The Heart´s Home welcomed everyone warmly, and soon the prayer started. There were people from different churches and nationalities. Several young children were present; obviously the place and its volunteer workers were well known among those poor children. One could observe that The Heart´s Home provides the children with attention and warmth which may be lacking in their homes. This prayer was a beautiful sign of hope and love in one of the poorest neighborhoods of Bangkok. The following week one of the brothers spent a whole day with students of the Lutheran seminary in Bangkok. The day was part of a five-day course on spirituality and meditation in the Christian tradition. 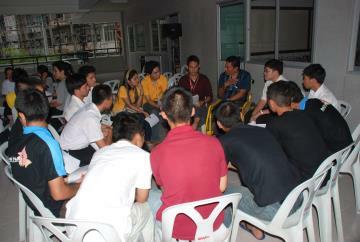 Discussion, sharing and interaction with the students were mutually enriching. Especially the group discussion based on the Letter from Chile of Br. Alois opened new insights of how we can be bearers of joy, compassion and forgiveness. Two prayers held during the day brought us to the source of these attributes, which is in God. « Choosing to love, choosing hope ». 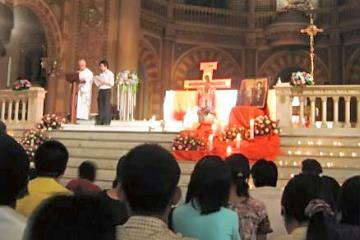 On the evening of 11 November 2007, Bangkok’s Assumption Cathedral was packed with people from various Christian churches and traditions, parishes, congregations, schools and communities when the long-prepared and much awaited event finally took place. The cathedral was beautifully decorated with Taizé icons in central places. The Catholic youth commission shouldered the main responsibility for practical arrangements, with a much help from people from other Christian backgrounds. The prayer went smoothly, joyfully and in a peaceful manner. Nearly all the songs were sung in the Thai language, and the Bible readings in Thai and English; the intercessions in several languages represented the international and ecumenical character of the prayer on this beautiful evening. Those taking part were not only residents of Bangkok; young people from Laos, Malaysia, Singapore and the Philippines were also present. In his meditation Brother Alois spoke about Christian hope, which begins around us. We can start this by paying more attention to the people around us, in particular to those who are poorer than we are. He wished that our groups and parishes could above all be places kindness of heart and of trust, places where we welcome one another. As the prayer neared the end, a large Taizé cross was placed on the floor. The singing continued, and people waited patiently in long lines to confide their burdens to Christ. It seemed that many people did not want to leave the church at all; some came closer to the cross, and the singing went on at length. Burdens were commended to Christ, and trust, joy and hope arose in our hearts. Prior to the prayer there was a workshop, which also gathered a good number of people, around 250 people. The preparation of this pilgrimage in Bangkok started early this year. Prayers were arranged in different places, in churches, places of suffering and hope, in schools. We gathered in Catholic schools, seminars, churches, in a Lutheran day-care centre in a slum, an Orthodox chapel, an Anglican church, among others. The involvement has been ecumenical, and this process of hope, love and reconciliation should continue in Thailand. During the preparatory prayers, many people expressed their hope to be able to come together to pray more often. Thailand has an extremely low percentage of Christians, about 1% of the population. This calls for common witness to Christ, peace, reconciliation and hope in this beautiful country. Praying together is certainly one of the best ways to continue on this road. * “We would like to express our gratitude to His Eminence Cardinal Michai Kitbunchu for being with us tonight and for his words of welcome. 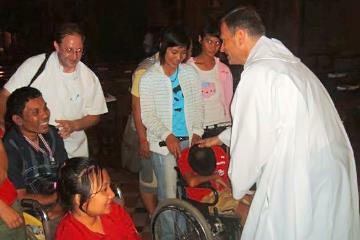 Bishop Pierre Bach, former Apostolic Vicar of Thaket – Savannaket in Laos, in charge of the Laotian diaspora. Dr. Banjong Chomphuwong, Vice-Moderator of Church of Christ in Thailand. Rev. Oleg Cherepanin, the Representative of the Russian Orthodox Church, Moscow Patriarchate. We are also very grateful for the presence of young people from Laos, Philippines, Hong Kong, Singapore & Malaysia who came especially for the prayer.